In a small saucepan, combine the chicken stock and 1 cup water and keep warm over low heat. In a large saucepan, heat the EVOO, two turns of the pan, over medium-high heat. Add the shallots (or onion) and garlic and stir for 2 minutes. Stir in the rice for 1 minute; season with salt and pepper. Stir in the wine and lemon zest until it has absorbed into the rice. Begin adding the warm stock a few ladlefuls at a time, stirring vigorously with each addition, until the risotto is al dente, 18 minutes. Stir the butter into the risotto to combine, then stir in the lemon juice. Stir in the cheese, basil and tarragon; season with salt and pepper. Serve immediately. In Recipes-list.com we have selected the most viewed recipes from category - uncategorized . Enjoy the best recipes specially selected for you! 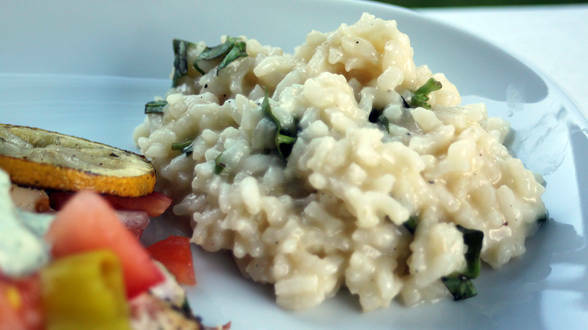 Amalfi-Style Risotto is the right choice that will satisfy all your claims.